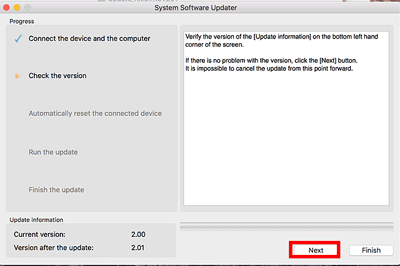 Unless stated otherwise, the file listed below must be installed BEFORE the RM-LVR3 System Software (Firmware) Update Ver.2.01 (Mac) in order for it to work properly. If more than one Required file is listed, install them in the order presented on this page. Power source for the device. The device which carried out full charge. 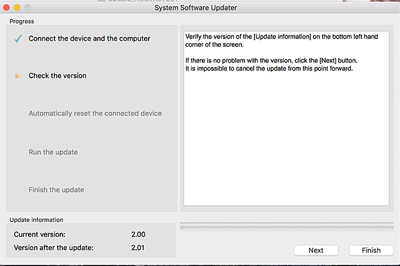 Note: The update can be performed only when the battery power level is (four marks) or more. We recommend that you use a fully charged battery. The file [Update_RMLVR3V201.dmg] file will start downloading. 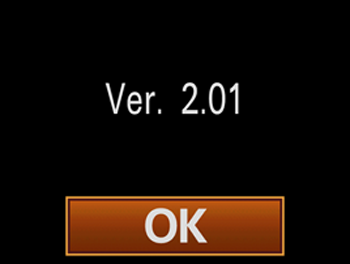 Double-click the [Update_RMLVR3V201.dmg] file you downloaded. Do not connect the device at this point. 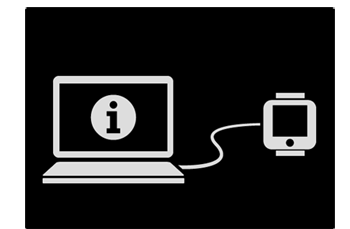 Connect the device to the computer with the supplied Cradle and USB cable. USB Mode appears on the LCD monitor of the device. Note: If Current version is Ver.2.01, the upgrade is not required. According to the message, stop the USB connection and click Finish. 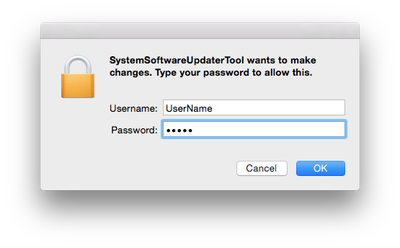 After automatically resetting, the following screen appears and the update starts. 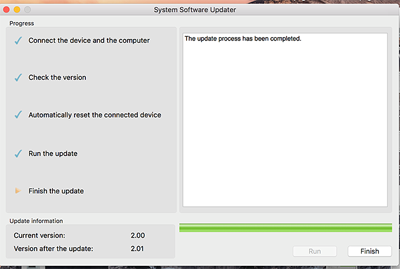 The progress bar appears while updating (approximately 8 minutes). Once the update is complete, the screen below will be shown. The device will automatically reboot, which may take a few minutes. 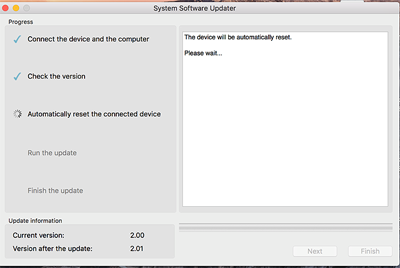 Please wait until the same screen on the LCD shows the same screen that appeared before starting the software update. 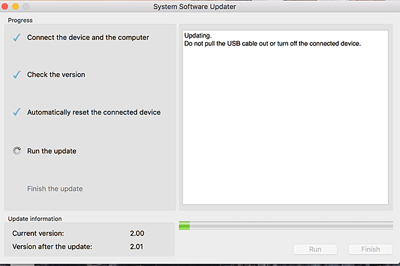 When the screen appears, press the [Finish] button and disconnect the USB cable.